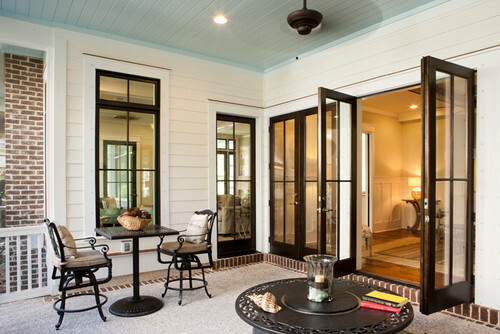 In Lowcountry architecture, the emphasis is placed on comfortable outdoor living spaces that protect users from the heat, humidity and insects. This style of home is also designed to create a cooling effect indoors with a central breezeway that encourages air movement throughout. All of these features, including gorgeous interior design, is what makes this particular home a memorable one. The home's exterior is clad in traditional and locally sourced materials, such as board and batten siding and a standing-seam metal roof. The balance of the sitting room and porch on other side of the front door creates a pleasing symmetry. The inside of this spacious 2,877-square-foot residence is open and airy with pale white walls and rustic wood floors. 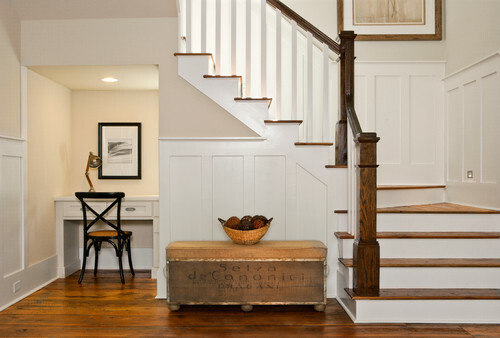 The interior decor is a careful combination of cottage and farmhouse themed materials and colors. Without a doubt, this 3 bedroom, 3.5 bath home is truly Lowcountry living at its finest. 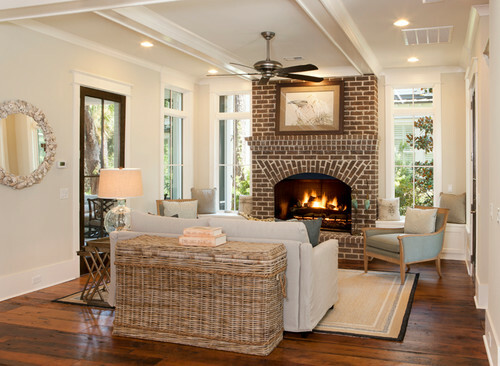 At the front of the home, a wood-burning fireplace, covered in stately red brick, immediately welcomes guests and provides a soothing burnt wood aroma. This sitting room also features coffered ceilings. 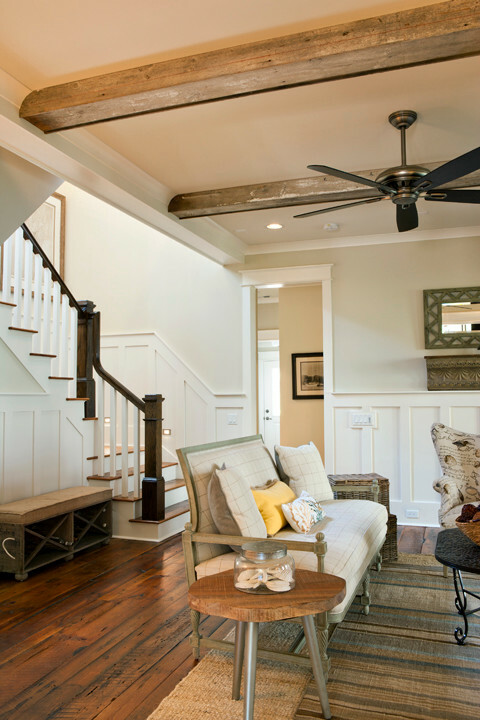 Worn wood flooring and rustic ceiling beams add a touch of farmhouse chic to this passageway and sitting area. A ceiling fan keeps air moving. Tucked beneath the staircase, a built-in desk provides a quiet place to work. Two rooms meld into one when the patio doors are swung open to one of the home's many outdoor living spaces. The covered porch has a ceiling painted a beachy blue that is said to keep away pesky bugs. 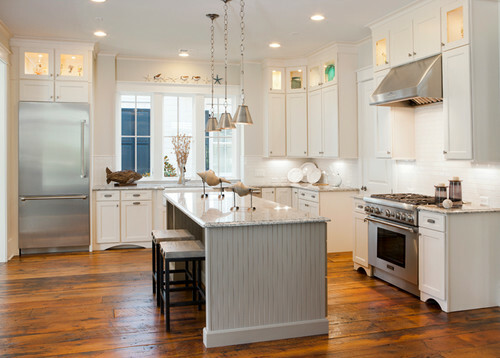 The custom kitchen is outfitted with Shaker-style cabinetry, curved cabinet feet and stainless steel appliances. It's designed around a central island painted a soft gray to contrast with the white cabinets. Stone countertops and a coordinating backsplash reflect light in the space and add a little sparkle. Next to the kitchen is a dining table that sits in front of two walls of windows. 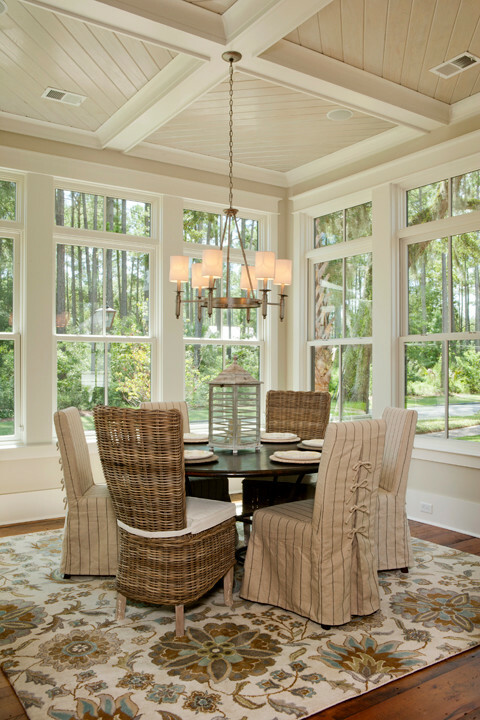 Although the dining room is inside, access to windows creates the effect of dining outdoors. A circular table fits perfectly into this refreshing angular alcove. 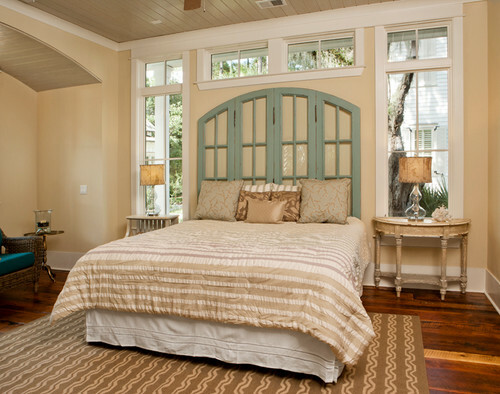 A unique window installation allows the master bed to fit neatly between the panes. Does this Lowcountry home have you longing to move South? If so, take a moment and share this article with your friends on Facebook. Using design cues from a milking barn that was erected in 1915, this home has all the classic touches of a century-old farmhouse yet fully benefits from modern style and technology. A young Michigan family makes a 100-year old farmhouse their own. 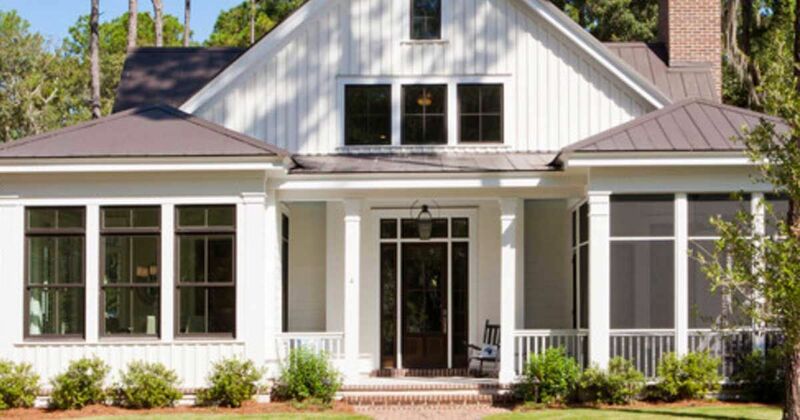 An elegant farmhouse provides plenty of space for a growing Alabama family.